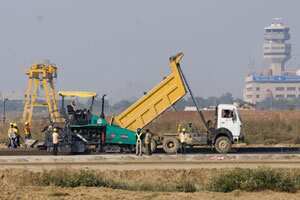 Mumbai: Infrastructure firm GMR Infrastructure Ltd is looking at bidding airport development opportunities overseas, according to Subbarao Amarthaluru, group chief financial officer at GMR group. GMR is currently controlling two airports in India -- Delhi and Hyderabad -- and two in overseas -- Turkey and Male. Subbarao said despite the economic slowdown the footfalls in airports are encouraging. “We have witnessed 23% footfalls in Delhi airport, 15% in Hyderabad, 23% in Turkey and 20% in Male," he said. Subbarao said he is not looking at any international opportunities as group’s plate is full with $7 to 8 billion worth projects for next three years.